I won’t tell you how much weight I’ve lost. Because the number don’t matter. It has taken me well over 15 years to realize that. As a sophomore in high school, I was teased for being overweight. After being called “chunky” and “butterball,” I got on the scale and vowed to make that number go down. And as it did, I discovered people seemed to notice me, and like me more. So I all but stopped eating as the number on the scale got smaller and smaller. At my lowest, I was 98 pounds. Over the next 12 years, I was up and down and all over the place. Always associating my worth with that number on the scale. If the number went down, I would berate myself for not losing more weight. If it went up, I’d be so frustrated I figured eating one more spoonful of cookie dough wouldn’t hurt. At my heaviest, I was 192 pounds. I wasn’t happy at 98. I really wasn’t happy at 192. And I had been a lot of numbers in between. “What number would finally make me happy?” I thought to myself one day. My immediate reaction to that thought shocked me. I actually laughed out loud at how ridiculous that sounded. How could any number define what made me, me? And how could any number magically make me happy? I started off slow and used an app on my phone to track my activity and nutrition. 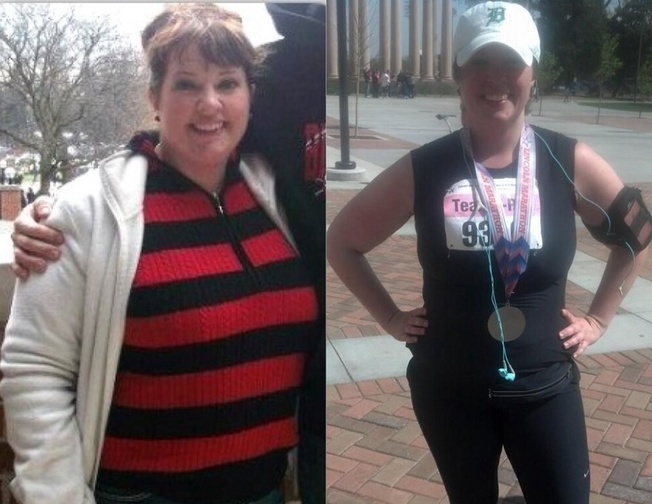 I set fitness, not weight loss, goals, and rarely stepped on the scale. When I did, I found it wasn’t moving much, but I didn’t care. I could feel myself getting stronger. I felt myself getting braver. I found joy in activities I hadn’t done in a long time. Biking, swimming, dancing. I wanted to try new things. Running was practically against my religion, but one day, I thought “What the heck?” and jogged for a couple minutes. I felt empowered. I had always told myself I wasn’t a runner. My bad ankle, short stature, little arms (which I lovingly refer to as “T-Rex arms”) were the not conducive to running. But here I was, running more and more each day, feeling better and better all the time. I kept on running, and completed my first half marathon on May 4th. I can’t wait to do more. I started this journey almost two years ago, and I will always be a work in progress. Working towards my next goal, doing my best to be healthy, trying not to take myself too seriously. I have off days. I’m still hard on myself from time to time. I am not a fitness or diet expert by any means, but if I can offer any advice it would be: believe in yourself, laugh at yourself. Who hasn’t awkwardly fallen off a treadmill or used a weight machine wrong? At least you’re out there, trying, moving forward. Define your own healthy, your own happy. Find your inner “grrr,” go get it, and have fun along the way. I also haven’t done it alone. I have amazing support from my boyfriend, my superhero, Matt, my family and friends (who I lovingly refer to as “Team T-Rex”). My weight loss is far from miraculous, my story far from unique. There are thousands of us out there fighting with that number on the scale. But I stopped fighting, and started moving forward. Because that number doesn’t matter. That number doesn’t define my happy. And that feels pretty damn good.